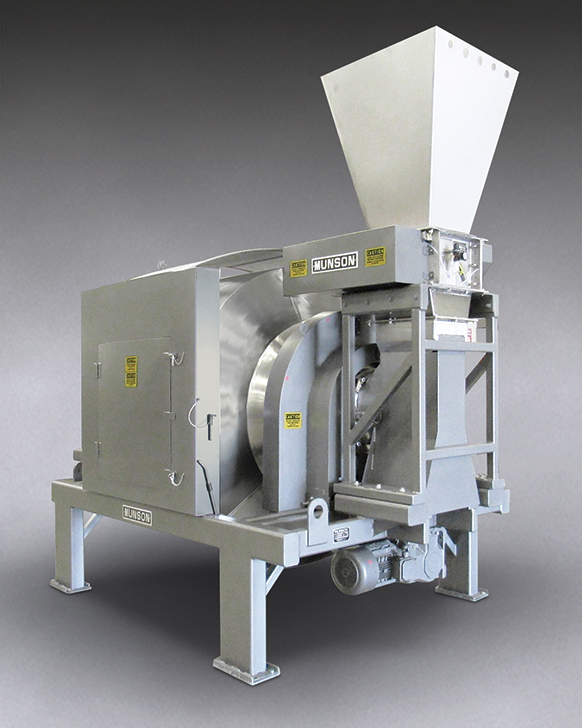 Rotary Batch Mixer with Integral Lump Breaker - Munson Machinery, Inc.
UTICA, NY — A new MUNSON® Rotary Batch Mixer with integral Lump Breaker provides inline de-agglomeration of compacted bulk materials before blending batches gently with total uniformity in one to three minutes. Inline stacking of the low profile De-ClumperTM model RDC-1515-SS atop the stationary inlet of the model 700-TH-50-SS mixer minimizes headroom requirements while eliminating the need for flexible connections or hard piping between the units. 120 RPM to prevent heating and degrading of the product. On-size material passes through bed screen apertures which range from 1/16 to 2½ in. (25 to 64 mm) in diameter, immediately prior to entering the stationary inlet of the mixer. As the mixer's horizontal drum rotates, proprietary mixing flights tumble, turn, cut and fold the material, imparting minimal energy to the batch, minimizing or eliminating degradation. Total uniformity is achieved in less than three minutes regardless of disparities in the bulk densities, particle sizes or flow characteristics of batch ingredients. The internal flights lift and direct the entire batch into the stationary discharge spout for evacuation with no residual "heel" of material requiring manual removal, eliminating waste and improving product quality while facilitating rapid, thorough cleaning. The mixer has a useable batch capacity of 50 cu ft (1.42 m3) and weight capacity of 4000 lbs (1814 kg), and is said to be equally effective in blending of batches from 100 percent to as low as 5 percent of rated capacity. New Rotary Batch Mixer with integral Lump Breaker from Munson Machinery reduces agglomerated or compacted bulk chemical, food or pharmaceutical materials and blends batches of ingredients gently with total uniformly in one to three minutes.